It’s funny because having grown up on “regular” meats – chicken, lamb, fish – over the past few years we have developed a love for venison. We do feel ever so slightly pretentious by seeking it out but actually it’s proving to be quite a versatile meat. We’ve had venison burgers, roast venison haunch, venison steak, venison biryani (at the wonderful Gymkhana restaurant in Mayfair) and now venison stew. A couple of weeks ago we bought diced venison from our friendly Sunday farmer’s market and dug it out from our freezer recently. The weather had just made a sharp turn into autumn, with a chill in the air in the evenings and nightfall approaching more rapidly than before. It also means that when we come in from work, we need to have something substantial already made otherwise we scavenge through our cupboards for quick comforting carbs which normally means we don’t get all the nutrients we need to face the plethora of bugs/viruses Londoners seem to carry around in tubes and buses and workplaces. (Loooong sentence. Phew!) Touch wood – so far so good! And there’s nothing more comforting than stew (though a pile of cookies and your favourite movie comes in a close second). 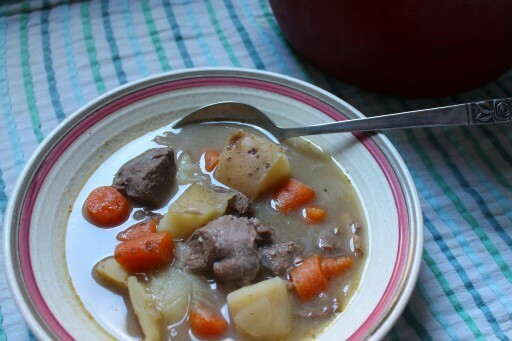 So we replaced our normal lamb with the diced venison, added chopped carrots, potatoes and stock, cooked it on low heat for 2 hours and we ended up with a delicious winter stew. Now we have no excuse for snacking before dinner! And the protein and liquid fills us up so we don’t actually feel like snacking after dinner either. Win-win. Take this recipe as more of a guideline really – feel free to chop and change the types and quantities of vegetables to taste – it’s quite forgiving! Also, in our experience it tastes much better after a couple of days in the fridge, which dries it out a bit and allows the flavours to meld. Add half of the chopped vegetables (including the garlic) into a large stockpot. Mix the flour with 1 tsp each of salt and pepper into a separate bowl. Dip each venison piece into the seasoned flour and add to the pot. When all the venison has been coated in flour and added to the pot, add the remaining vegetables to the pot. Pour in the stock over the ingredients in the pot, topping up with water if necessary to ensure that the ingredients are completely submerged. Set the pot over medium heat, and add the za’atar/oregano, Worcestershire sauce and paprika. Give it all a good stir. Bring the mixture to a boil, then reduce the heat to low so that the mixture gently simmers. Cover the pot and leave to cook for about 2.5 hours. Feel free to stir every once in a while. 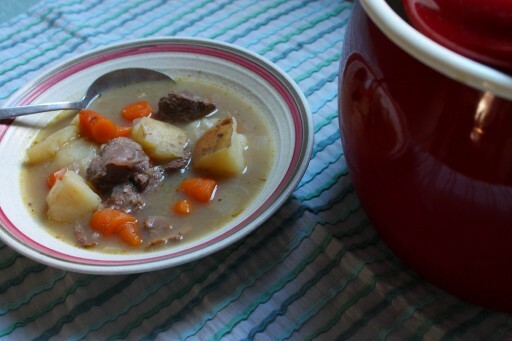 When the venison is tender, check the stew for seasoning and add salt and pepper to taste, if needed. 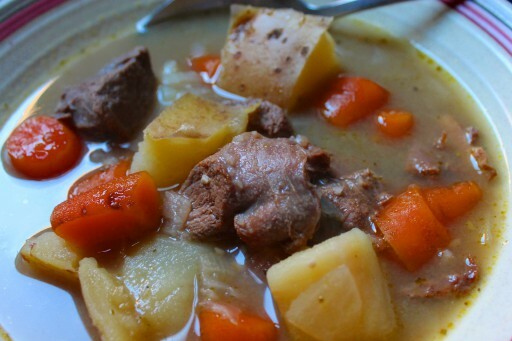 If the stew is not thick enough for your tastes, uncover the pot and cook for about 15-20 minutes so that some of the liquid evaporates. Eat (preferably with some crusty bread)!